• Fast and sensitive. Linear detection range (20 μL sample): 0.008 to 10 U/L for a 30 minute reaction. • High-throughput. Homogeneous "mix-incubate-measure" type assay. Can be readily automated on HTS liquid handling systems for processing thousands of samples per day. • Acid Phosphatase (ACP) is an enzyme which catalyzes the cleavage of phosphate groups from other molecules during digestion. 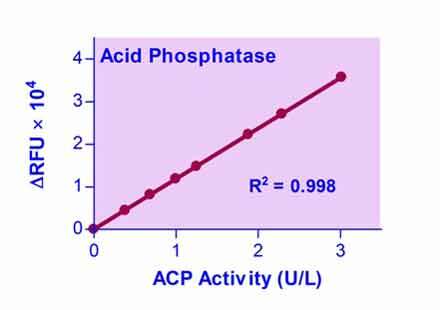 Acid phosphatase can be found in lysosomes and become active after fusing with endosomes, acidifying the pH and, thus, creating an optimal environment for ACP. ACP can also be found in bone, spleen, liver, kidney and blood. Serum levels can be used as a biomarker for prostatic carcinoma, although prostate-specific antigen (PSA) is more widely used. BioAssay Systems non-radioactive, fluorimetric ACP assay is based on the cleavage of methylumbelliferyl phosphate. Methylumbelliferone becomes intensely fluorescent after addition of the stop reagent. The increase in fluorescence at 360/450 nm after addition of the stop reagent is directly proportional to the enzyme activity. 1. I don't have the correct wavelength filter, will the assay still work? Typically if you are within ± 20 nanometers the assay will still work, but have slightly reduced sensitivity. Some assays have a narrower peak than others, call our tech support for a spectrum to verify. 2. I don't have a 96-well plate, will the assay kit work in a 384 well plate, cuvette, etc? Yes, the assay can be used in any standard plate and cuvette. Simply adjust the total reaction volume to your container. For 384 well use 50 μL, for a cuvette use 500 μL or 1 mL. 3. Does the assay kit work in particular species? Yes, this assay works in all species. 4. How do I prepare cell or tissue samples for assays? Blood samples: Serum and plasma should be diluted 2-5 fold. Tissue: Prior to dissection, rinse tissue in Tris buffered saline (pH 7.4) to remove blood. Homogenize tissue (50 mg) in 200 μL 50 mM Tris buffer (pH 7.5). Centrifuge at 14,000 x g for 10 min at 4°C. Remove supernatant for assay. Cell lysate: Collect cells by centrifugation at 2,000 x g for 5 min at 4°C. For adherent cells, do not harvest cells using proteolytic enzymes; rather use a rubber policeman. Homogenize or sonicate cells in an appropriate volume of cold 50 mM Tris buffer (pH 7.5), approximately one million cells per mL. Centrifuge at 14,000 x g for 10 min at 4°C. Remove supernatant for assay. All samples can be stored at -80 to -20°C for at least one month. Yes, unused reagents can be stored according to the assay protocol. Repeated freeze/thaw cycles of reagents should be avoided. Since Assay Buffer is very light sensitive, always keeps buffer in the dark (amber bottle or tube) as much as possible for long term usage.